I have long loved time at the table. It's where stories are shared and flavors come alive. It's a place where lovely and delicious intersect and change people…for good. It's a special day today. It's my mama's birthday! Everyone knows how much I love my mama - I am a proud Mama's Boy. I am very blessed to have such a strong, sweet, supportive, fun parent who every single day takes her job as a mother seriously – even now. This morning, I found this photo of Mama sitting down at the family dinner table with me and her sister, who is the same age as I am. 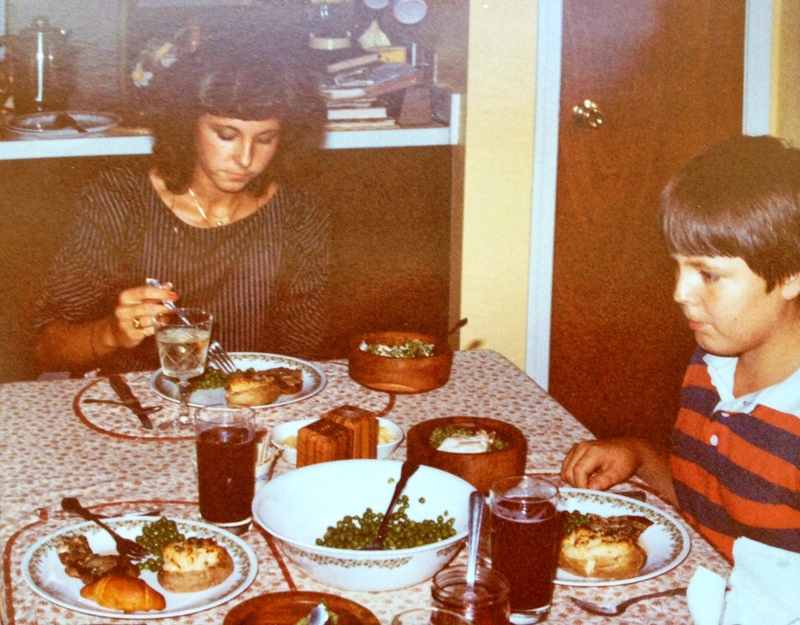 My Aunt Ellen and I were on summer vacation after finishing fourth grade and wanted to make a special meal for her. We pulled out Mama's big Betty Crocker Cookbook and after poring over the recipes settled on Steak Diane - I think because it sounded so fancy. We chose Twice Baked Potatoes, too. They involved several different cooking techniques: baking, mashing, "re-scooping" and baking again, which seemed like a big challenge for us two ambitious kids. Peas, which were frozen, fresh salad, that we chopped ourselves, and Crescent Rolls rounded out the meal. This was the first "formal" dinner I had ever prepared. I remember being excited and anxious. I also recall feeling so grown up. I was doing what I really loved to do, even then. Mama was so patient with me and my aunt...and so complimentary. To this day, it is still the most lovely and delicious meal I have ever eaten. I now get that satisfied feeling whenever I cook a meal for my loved ones. I appreciate my mom so much for nurturing my love of sharing food and connecting people especially through my early years. I treasure our time at the family table and look forward to sharing many more meals together. Happy Birthday Mama.